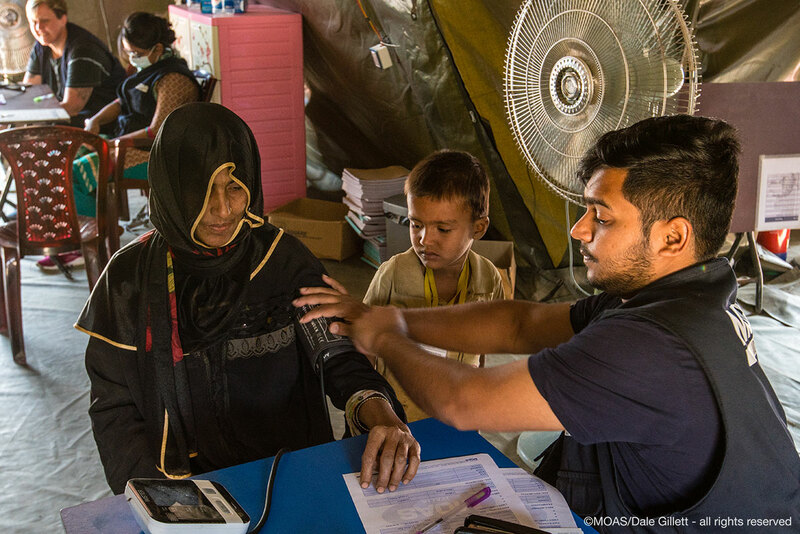 Since their creation in October of 2017, the MOAS Aid Stations have treated over 60,000 patients, Rohingya refugees and Bangladeshi host community alike. The dedicated and experienced teams of medics, pharmacists and cultural mediators have treated conditions as simple as rashes and as complex as gunshot wounds or post-partum complications. In this blog post, we take a look back over the last few months and explore the workings of the facilities, the trends we’ve seen in trauma and outline the most common conditions found amongst our patients. Overall, a significant proportion of our patients come to our Aid Stations with respiratory, skin and gastro-intestinal complaints. Their conditions can be hereditary, but in most cases are created or exacerbated by situational factors: the lack of hygiene and sanitation in the camps, combined with the sheer volume of people co-existing in very small spaces can make refugee camps a fertile environment for communicable or autoimmune diseases. The MOAS Aid Stations are open daily between 9am and 5pm, providing primary health care, front line trauma treatment, maternal health services and a pharmacy. Our target population covers both Rohingya refugees (est. arrivals since 25th August 2017: 700,000) and the host communities that have welcomed them in, especially where the latter are underserved in their access to healthcare. The primary health care largely consists of triage exams, followed by out-patient consultation and free medicine distribution, although occasionally on-site treatment or transfer is required. To read more about our Aid Stations read our walkthrough blog post here. Most trauma presentations we get at the Aid Stations are focused on minor conditions such as cuts & scrapes, but more serious injuries sustained through traffic accidents or workplace incidents is also common. In recent months there has been a decrease in patients presenting with injury sustained through violence, such as gunshot wounds or stab wounds, as the influx of new arrivals crossing the border has slowed and the trends in trauma reflect the more typical accidents of daily life (falls, accidents etc). In the case of major trauma, our team stabilizes the patient(s) and then proceeds to assess whether further treatment or consultation is required at one of the other referral facilities across the referral pathway. This may require the MOAS team to make use of one of the on-site ambulances to transfer critical patients to a local hospital or specialist clinic. Should a patient require emergency care out of hours (from 5pm to 9am the next day), there is always a MOAS medical team on-call and available. These on-call rotations are situated nearby to the clinics and can be called in to assist with any urgent case from accident and trauma to birthing or maternal health. Let us now take a closer look at the most common diseases that are seen at the MOAS Aid Stations. 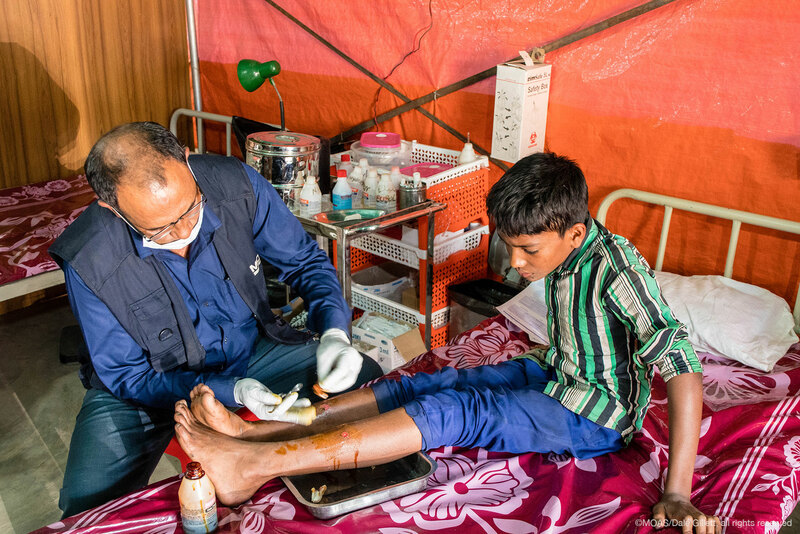 Since we began our programs in Cox’s Bazar, our hard-working medical professionals have come across approximately 1200 cases of AWD (acute watery diarrhea): this reflects the poor hygiene and lack of appropriate nutrition in the camps. AWD can also be a symptom of serious communicable diseases like cholera, dysentery and so on, so it needs to be taken seriously and monitored and reported appropriately. Respiratory conditions such as RTI (Respiratory Tract Infection) and ARI (Acute Respiratory Infection) are also widely seen: there have been over 2900 cases of both conditions combined since the Aid Stations opened. 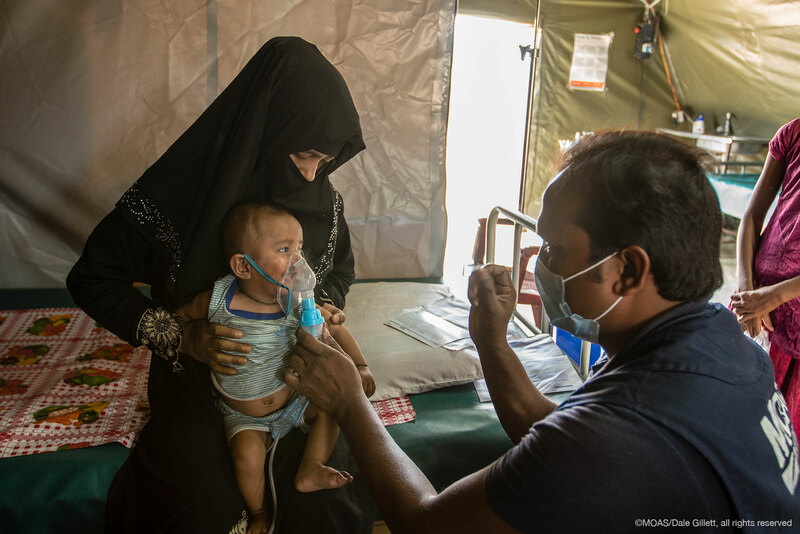 Respiratory conditions are very common amongst our patients, predominantly as a consequence of the environment: a very dry winter climate that brings dust to the air and a humid summer climate, in addition to living quarters that require cooking fires to be lit inside shelters, trapping smoke inside. In addition to the conditions mentioned above, our teams have also seen an extremely high number of cases of PUD (Peptic Ulcer Disease) with over 3700 cases having been diagnosed so far. PUD can be caused by poor or inadequate nutrition, as well as by stress and anxiety. Chronic stress can have a serious effect on the body and protracted refugee crises often see high incidences of stress-related illness. Other conditions commonly seen by our teams are a variety of skin conditions, skin infections or rashes which can generally be classified as allergic, parasitic or autoimmune. Since the opening of the Aid Stations, over 7% of the conditions treated have been skin conditions. These are a direct reflection of the poor hygiene, lack of access to clean water and compromised immune systems exacerbated by malnutrition. As the monsoon and cyclone seasons get underway we expect to see an increase in the need for health services and a shift in the trends in conditions being seen by our medics. We will continue to treat our patients while we monitor and report on these trends and try to control the spread of disease wherever we can. 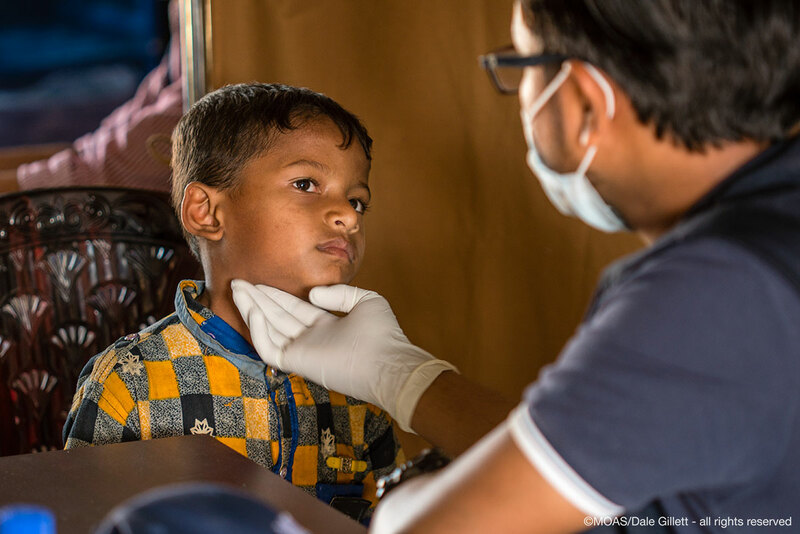 Whether faced with common or rare conditions, MOAS will continue to be on the frontlines of the ongoing health crisis in Bangladesh. Our medical teams on the ground will continue to provide quality primary care, treatment and medication to the most vulnerable communities in the world. We call on the international community not to forget those who suffer as a result of the Rohingya refugee crisis and take immediate action to provide support to the refugees and communities offering them hospitality. You can support our work in Bangladesh by donating here, or fundraise with friends to become a part of our activist community. You can also receive regular updates by signing up to our newsletter at the bottom of this page or following us on Facebook, Twitter and Instagram.